Saw this in Reinforced Plastics newsletter today. Almost two years later than the coupe, the Lamborghini Aventador LP 700-4 is now available in a Roadster! "The Aventador LP 700-4 coupe, which is based on a carbon fibre composite monocoque, was introduced in the summer of 2011. More than 1300 units have been delivered to customers. The new Lamborghini Aventador LP 700-4 Roadster convertible has a two-piece carbon fibre composite roof manufactured using various technologies such as resin transfer moulding (RTM) and Forged Composite®. The two parts, which each weigh less than 6 kg, are removable, easy to handle, and being lightweight and simple to attach, can be stored in the front luggage compartment. 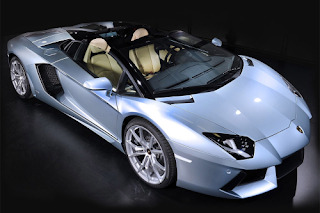 The Aventador LP700-4 Roadster is powered by a centrally located, 6.5 litre aspirated V12 engine generating 700 hp. The car accelerates from 0 to 100 km/h in 3 seconds and has a maximum speed of some 350 km/h."